Winter arrives in Northumberland and with the dark nights comes the Christmas Lights Switch On events and Christmas Fairs, Fayres and Fetes around the County. Tickets are also now on sale for the ever popular Kielder Winter Wonderland open every weekend from Saturday 17th November until Saturday 22nd December. 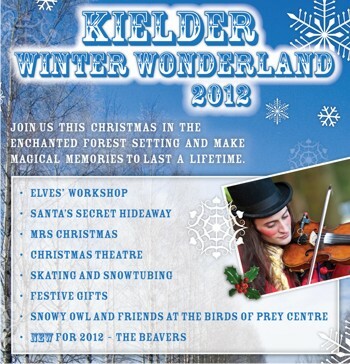 Kielder's magical forest landscape, will transform into an enchanted Winter Wonderland, full of surprises and attractions for the whole family. In the Elves’ Workshop visitors will join Santa’s elves in their enchanted barn and help them to prepare for the big day by becoming toy makers. Book tickets online here. Always a fun night and gets you right in the mood for Christmas, the lights will be switched on around the County during November. Warkworth kicks us off with their lights and a late night evening of shopping on the 16th November. Morpeth follows on Saturday 17th November (and 24th November) from 3pm and then Amble have theirs with a Torchlight Procession on Sunday 18th November. The following weekend sees the Duchess of Northumberland turn on the Alnwick lights on Friday 23rd November from 6pm, the same night as Hexham lights up. Morpeth has its second celebration with the added bonus of a Mistletoe Fair from 4pm in the Town centre. Berwick's Christmas Lights will light up on the first day of December from 4.30pm with a ceremoney on the steps of the Town Hall. However you like to spell it, November sees the festive season kick off for many with lots of Christmas events taking place. Our top picks are the Christmas Festive Gift Fair at Belsay Hall on November 10th and 11th, Brockbushes Christmas Fayre from 8th to 11th November and Vallum Farm Christmas Fayre on Saturday 17th November from 11am to 11pm! Vallum have teamed up with Taste NE, Appetite and Cheers magazines to stage the Fayre, there will be food, drink and craft/gift producers in their newly restored Old Cow Barn. Click here for more information. Another great Christmas Fair is being held at Newbiggin Maritime Centre on Saturday 24th and Sunday 25th November between 11am and 4pm. It will be two days of the finest art work, crafts and unique one off gifts made by makers from across Northumberland. With prices to suit all pockets you’re certain to find something special to put under the tree. If you are a crafter or are interested in having a stall call Mark on 01670 811951 or ask at reception at the centre. A festival of opera, classical and traditional music the Northumberland Music Festival returns in 2012 from Friday 9th November to Sunday 18th November. Performances will be held at three of Northumberland’s finest houses: Eshott Hall, Doxford Hall and Guyzance Hall. Visit their website for more information. There is a full list of events for the month of November below, with web links where available for more information. For regular updates and news don't forget to follow us on Twitter and Facebook.